Join in as easy as 2 steps! at ilagay sa envelope along with you and your baby’s information! together with a proof of purchase and include this in an envelope. Click here para silipin ang mas pinaraming drop box areas! Every journey starts with a destination in mind. As parents, we share one common goal for our kids: secure their future with a good education. With Sun Life’s MyFuture Fund, we can help you get to your destination, on time! What is Sun Life’s MyFuture Fund? MyFuture Fund is a fund option exclusive for our investment-linked life insurance products, specifically. It is a target date fund that invests primarily in high-quality stocks and a mix of government and domestic corporate debt in accordance with an asset allocation strategy that promotes capital appreciation at the onset to maximize earning potential in the earlier years and shifts to wealth preservation to reduce exposure to risk as the maturity of the fund approaches. How does MyFuture Fund work? STEP 1: Set a target date for your specific goal. Depending on your chosen goal, such as sending your child to college, you have five target dates to choose from – MyFuture Fund 2020, MyFuture Fund 2025, MyFuture Fund 2030, MyFuture Fund 2035, and MyFuture Fund 2040. STEP 2: Choose a fund that matures closest to your target date. So you can have the necessary fund to reach your goals! STEP 3: Pair it with an investment-linked life insurance that suits your financial requirement. Choose from the following - Sun Life’s MyFuture Fund, Sun Life’s MyFuture Fund 1, Sun Life’s MyFuture FundAssist, Sun MaxiLink One 1, Sun MaxiLink Prime, and Sun MaxiLink Bright. What are the benefits of MyFuture Fund? Unlike traditional savings with fixed interest rates, MyFuture Fund provides higher earning potential as the assets are invested in high-yielding instruments in the initial years then gradually shifts to fixed-income instruments with modest growth potential as it approaches maturity. You have Sun Life Financial's investment experience, commitment and research capabilities working for you. Your investment is placed not just in one or two, but in as many instruments as is prudent, reducing over-all risk. MyFuture Fund units can be redeemed on any business day. This Fund attempts to maximize returns in the earlier years for faster fund accumulation then shifts to a more conservative portfolio to reduce exposure to risk as the date of the maturity draws near. If you want to know more about Sun Life’s MyFuture Fund and other wealth management products, vo to www.sunlife.com.ph or follow our social media accounts via @sunlifeph. 500 Consolation Prizes Winners will also win National Bookstore Gift Certificates worth 3,000 PHP! National Bookstore GCs may be used in any of the National Book Store branches nationwide. Any item may be purchased from National Book Store using the Gift Certificates. Winners will be receiving Gift Certificates in 6 x 500 peso denominations. NL DAGUPAN 2nd Floor East Gate Plaza, # 231 AB Fernandez Ave., Dagupan City. VISAYAS JUNCTION 1 PALAWAN Ground Floor & 2nd Floor Junction 1 Centre Puerto Princesa North Road Barangay San Miguel Puerto Princesa City Palawan. Fast N Safe Distributor Inc.
Aileen Paul Sales Marketing Corp.
Abbas Best Commercial Distributor Inc.
Akromontworld Marketing and Distribution Corp. Teams Sales & Promotions, Inc.
Davao & Dadiangas Distribution System Inc.
A participant may join in the nationwide raffle promo by collecting the required number of EQ packs. Contain the required number of EQ packs per pack type and brand. (Please see Table 1 above). Have at least ¾ of the original wrapper intact. EQ Logo and number of points on the side should be intact. Entries containing soiled wrappers (wrappers contaminated with urine, feces or mud, discolored or faded wrappers) will be disqualified. Customers can send as many entries as they want with the corresponding required number of wrapper/wrappers per entry. (Please see table 1 above). *Sun Life’s MyFuture Fund is an investment and insurance plan that will help winners realize their financial goals within a pre-identified time-frame (e.g. after 18 years). The investment component will be placed in a fund with a target-date (based on pre-identified time-frame) called MyFuture Fund. All participants will be asked to execute the following authorization form to allow them to join the Promo: By submitting a promo entry, you hereby authorize Sun Life of Canada (Philippines) Inc. and JS Unitrade Merchandise, Inc., their employees, duly authorized representatives, related companies, third party service providers, and vendors and consent to the use and processing of your personal and sensitive personal information to contact you with marketing or promotional information regarding financial, insurance products and studies/surveys to be conducted by the Companies including phone calls, mail, email, SMS or any type of electronic message. This authorization and consent shall continue to have effect until expiration of the retention limit set by laws and regulations, unless withdrawn in writing or withheld due to changes in the information supplied by the Companies. All submitted entries and contact details will be shared with Sun Life. A Sun Life representative may call you to discuss the many benefits of the Sun Life Fund. If you do not wish to be called, you may PRINT and FILL UP this opt out form and SUBMIT along with your entry. All entries will be drawn at the following JSU Warehouse at 9AM of December 28, 2018 and will be attended by JSU and DTI representatives. - Lot 2, Blk 5 Crescent Road cor. Middle Road Cebu Light Industrial Park (CLIP) Brgy. Basak Lapu Lapu City Cebu. Within a week after the grand draw, drawn winners will be informed through registered mail. After verification of winners (through calls), winners will be posted in Philippine Daily Inquirer and EQ Diaper official Facebook page. Registered mail will be sent to the winners and will be called by a JS Unitrade representative. Winners should bring their notification letter plus 2 valid IDs (e.g., driver’s license, SSS/GSIS card, passport ID, student ID, company ID) and baby’s birth certificate for verification purposes. Baby’s birth certificate and Baby’s details on the raffle entry should be the same. JS Unitrade will issue a letter to Sun Life endorsing the verified GRAND PRIZE winners to claim their prizes. A Sun Life agent will present and explain to them what they won -- Sun Life’s My Future Fund Insurance + Investment (in MyFutureFund 2035)* worth P150,000, at their preferred time and date within 60 days from receipt of the registered mail. JSU will issue the National Book Store Gift certificate worth P3,000 ; to be claimed in any of JS Unitrade offices. JS Unitrade Merchandise, Inc. – Main Office, 20th Floor, Marco Polo Ortigas Manila, Sapphire Road, Ortigas Center, Pasig City. JS Unitrade Cebu Lot 2, Blk 5 Crescent Road cor. Middle Road Cebu Light Industrial Park (CLIP) Brgy. Basak Lapu Lapu City Cebu. Winners may opt to have their Gift certificates shipped to their house given that shipping fee will be shouldered by the winners. Employees of JS UNITRADE, SUN LIFE and NATIONAL BOOK STORE, their advertising agencies and suppliers, including their relatives up to second degree of consanguinity or affinity are disqualified from joining the raffle promo. Promo participants can only win once within the entire promo duration. I have only kept a portion (a small tear) of the wrapper. Will that count as a proof of purchase or do you need the whole wrapper? EQ wrappers should show at least ¾ of the original wrapper intact. EQ Logo and number of points on the side should be intact. The nearest Sun Life office, National Bookstore branch, JS Unitrade office or JS Unitrade partner distributor is far away from me. Can I just have it mailed using a courier service? You may hand-carry or mail your entry to the nearest JS Unitrade office during office hours. Can I drop more than 1 entry? You may send as many entries as you want as long as they are complete and valid. More entries mean more chances of winning. Please note, however, that participants may only win once. What kind of wrappers will be accepted as proof of purchase? Can I combine different variants/size packs in my entry? Each entry is specific to each brand, hence, we cannot combine different variants and sizes. to view the kinds of EQ wrappers accepted and the quantity , click here bit.ly/EQSunLifepromo2018 and look for Table 1. Kindly make sure that the wrappers show at least ¾ of the original wrapper intact. EQ Logo and number of points on the side should be intact. Where is the nearest dropbox area? 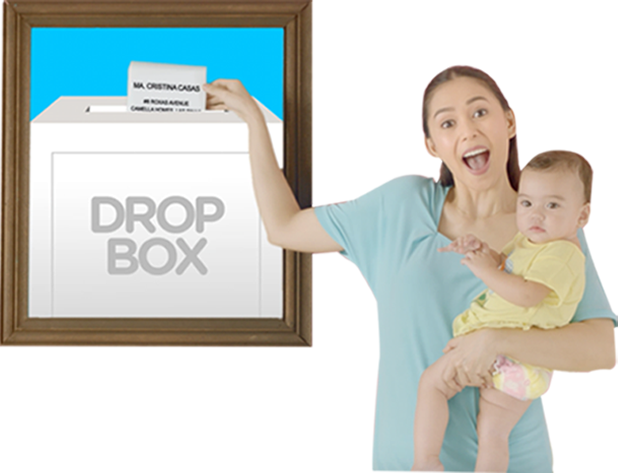 For your convenience, we've made a list of dropbox centers around the Philippines. You may Click Here to view all drop box areas! You may also hand-carry or mail your entry to the nearest JS Unitrade office during office hours. What time is your cut-off on the last day of sending entries? I am planning to mail my entry. Am I guaranteed that my entry will be accepted as long as I send it on the last day? If you are planning to hand-carry to the nearest JS Unitrade office or drop in the designated Sun Life, National Book Store and JSU partner distributors dropbox areas, all entries must be in on or before December 14, 5PM. For mailed entries, we will still accept those who sent their entry on the last day (December 14) as long as we received it before the draw date (Dec 28, 2018). EQ Diapers or JS Unitrade is not responsible for lost or late entries caused by your chosen courier service. How many draws will you have for this promo? There is only one draw date happening on December 28, 2018. There will be 5 Grand Prize winners of Sun Life’s MyFuture Fund insurance + investment worth P150,000 (1 grand prize winner per area)and 500 Consolation Prize of National Book Store Gift certificate worth P3,000 (100 consolation prizes per area). All winners will be notified via call and registered mail 1 week after the draw date . The list of winners will also be published on the Philippine Daily Inquirer after the verification process (through calls) and will be posted in EQ Diapers website. Are the winners selected per area (Luzon, Visayas, Mindanao) or will all entries be mixed together and then draw? The 5 grand prize winners will be drawn from different areas. One (1) winner each for GMA, North Luzon, South Luzon, Visayas, and Mindanao. The 500 consolation prize winners will also be drawn from different areas. One hundred (100) winners each from GMA, North Luzon, South Luzon, Visayas, and Mindanao. A Sun Life agent contacted me about their products. Does that mean I won? All winners will be notified through registered mail and phone call. However, a Sun Life agent may still contact you (whether you're a winner or non-winner) to explain the prize. If you submitted the form that doesn't allow Sun Life to call you, then you will not receive this call. If you did not submit the form, then please expect a call from Sun Life. Is my prize transferrable to another person? Yes, your prize is transferrable meaning you can transfer the prize to anyone. To know more about the process, kindly discuss this matter with the Sun Life agent that contacted you. Is my prize convertible to cash? Your prize is not convertible to cash. However, if you are one of the grand prize winners of Sun Life’s MyFuture Fund, kindly discuss this matter with the Sun Life agent that contacted you to know how you can potentionally grow your prize. Will there be a chance that I can win more than once? I have more than 1 kid so I hope to win more than once by sending more entries. "A participant may only win once. Winner will be the participant (adult). " I am one of your grand/consolation prize winners but I already live in a different area/ I am using a different number now. How can you verify or contact me about my prize? Please message us on our official Facebook Page with your updated contact number so we can call you and discuss your prize. What is a complete entry set? What can make my entry invalid? - Make sure to have the complete required number of EQ wrappers and correct packs. 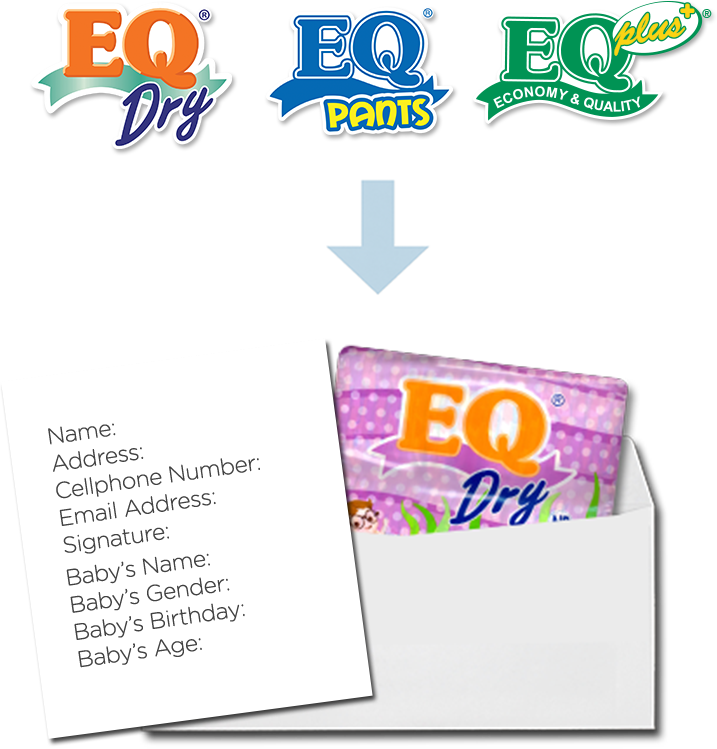 To see the accepted EQ Packs, quantity and combinations, Click Here for Full Mechanics. - EQ wrappers should show at least ¾ of the original wrapper intact. EQ Logo and number of points on the side should be intact. - Entries containing soiled wrappers (contaminated with feces or mud, discolored or faded wrappers) will be disqualified. - Write clearly when completing your form. The following information should be readable: Name, Address, Cellphone Number, Email Address, Signature, Baby’s Name, Baby’s Gender, Baby’s Birthday, Baby’s Age. If you are drawn as the winner, we will need to check that the baby's declared birthday in the form matches with the birth certificate to be submitted. This is part of the verification process. What is an opt-out form? If I have an opt-out form, will that mean I have a lesser chance of winning? Having an opt-out form does not lessen your chance of winning. I have a Sun Life / My Future Fund-related concern. You may inquire directly to Sun Life for your policy concerns. I have already dropped my entry but I want to get it again because I have to change something In my contact details. Can I do that? Once sent, the entry is already considered final. Kindly check your entry if it's complete and error-free before submitting. I am one of the winners and I emailed JS Unitrade. Nobody has contacted me yet. Kindly provide the following: full name, contact number, address, and the location where you sent your entry. We will double check and get back to you as soon as possible. I called/emailed Sun Life, NBS to check if they have received my entry. Nobody is answering / I don't know who to talk to. JS Unitrade Merchandise, Inc. – CDO, Unit G Warehouse, Neotrinity Central, National Cugman Highway, Cagayan De Oro City"
Can I just send my entry via Facebook or email? I will take photos of the wrappers and my baby. All entries should be dropped in the designated drop box areas, we have more than 150 drop box areas nationwide to make it more accesible for you. Please click here for the full list. Entries sent on Facebook are not valid. I am one of the grand prize winners but I am not interested in a mutual fund investment. Can I change it to a different Sun Life investment? You may discuss this matter with the Sun Life agent who will get in touch with you. I am one of the grand prize winners but I am not interested in a mutual fund investment. Can I just get the 150,000 pesos in cash immediately? I am one of the consolation prize winners. Until when is the GC validity? National Book Store Gift Certificate has no expiration. I am one of the consolation prize winners. Until when is the GC validity? Can I just get convert the GC to cash? Prizes are transferrable but not convertible to cash. My kid has an existing educational plan. Can I combine it with My Future Fund? When you say it can potentially grow to as much as P1 million, that means it can be also lower than that? I'm afraid that it's just really 200,000 worth of prizes that I am getting. Where can I use the National Book Store GCs? What items can I buy using the National Book Store GCs? You may purchase any item from National Book Store using the Gift Certificate. What would be the denomination of National Book Store GC? A Sun Life agent will call the grand prize winner and will set a schedule to present and explain to them what they won -- Sun Life’s My Future Fund Sun FlexiLink Insurance + Investment (in MyFutureFund 2035)* worth P150,000, at their preferred time and date within 60 days from receipt of the registered mail. JSU will issue the National Bookstore Gift certificate worth P3,000.00 ; to be claimed in any of JS Unitrade offices. Winners may call JS Unitrade Merchandise Inc Main office at (02) 916 1111 prior to coming to the office to claim their prize. Claiming of consolation prizes is only Monday to Friday, 8am-6pm.